your access to the site will be restricted. This is all the info we require. You will receive a confirmation email as a spam prevention method. This is the only time we�ll email you. 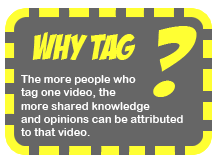 You must be logged into a VideoTag account to watch and tag videos.